Fortnite maintained its standing as a revenue monster in Q2, compared to its App Store fellows and compared to games on Google Play. The game made over $40 million in net revenue in the US alone three months after launch, and brought in an average revenue per install (ARPI) of $3.47. For the period of April 1 through June 30, SensorTower's quarterly report shows that Fortnite was ranked the fourth most-downloaded game in the US on iOS and the sixth most-downloaded game across both iOS and Android (despite not being available on the latter). 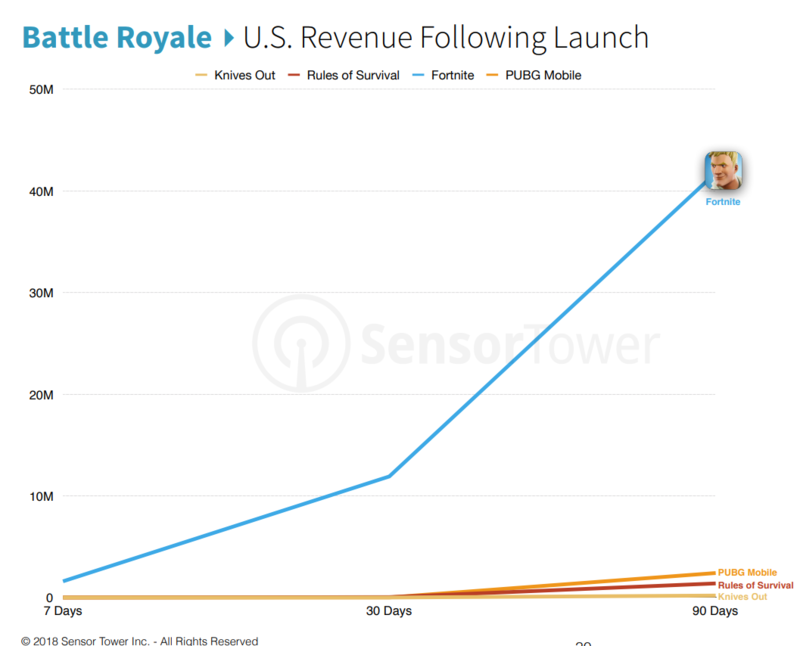 Its revenue success is especially notable when compared to other battle royale games over a similar period of time. For example, Fortnite's 90-day $3.47 ARPI is far and above PUBG Mobile's $0.13 ARPI three months after its launch. That $40 million in US revenue over the first 90 days is also far above US revenue for PUBG Mobile, Rules of Survival, and Knives Out (none of which scraped 10 million over their first 90 days), and Fortnite continues to be a revenue giant according to a report from Apptopia today estimating that Fortnite mobile has brought in $160 million worldwide since its launch. Helix Jump was the most-downloaded game both worldwide and in the US, with Love Balls (#3 and #2 respectively) and PUBG Mobile (#2 and #5) also topping the charts. Voodoo, Helix Jump's publisher, was overall the #4 ranked app publisher (behind Facebook, Google, and Tencent), with its most successful game downloaded over 100 million times in Q2. 80 million of those downloads were on Google Play. Overall, first time app downloads across both stores grew 14.6% year-over-year to around 25.9 billion downloads. The App Store on its own increased about 12.9% YOY, and Google Play saw an increase in downloads of 15.6%. Games remained (by far) the most popular app category, with game installs growing nearly 13% on the App Store YOY, and 16% on Google Play. In the country breakdown, India led downloads at well over four billion installs for the quarter, 97% of which were on Google Play. The US and Japan were the only two countries in the top 10 with more App Store installs than Google Play.